Summary: Doomsday is not the sort of film to be taken too seriously and captures the spirit of the films it borrows heavily from to best effect. Encouraging a promising writer/director to spread their wings and explore their potential with a bigger budget and more expansive story is a natural progression in the filmmaking world, and for Englishman Neil Marshall there are many who will have been eagerly awaiting apocalyptic actioner Doomsday. He scored a couple of cult horror hits with werewolf movie Dog Soldiers and caving thriller The Descent, both very much genre films lapped up by gore fans. Then he got the most from their claustrophobic settings, and now he has been entrusted with a greater scope as he attempts to mash together 28 Days Later, Escape from New York and Mad Max. It’s an admirable attempt, but also a case of Marshall getting a little too carried away with his new-found freedom. Doomsday starts with a 28 Days Later-style outbreak of a killer zombie-creating disease called the Reaper Virus in Scotland. The country enclosed by the military and the people left for dead, 30 years later in 2035 England is on the brink of chaos when the Reaper Virus rears its head in an overpopulated London. The government’s answer is to send a crack team of operatives into the quarantined Scotland where spy satellites have picked up sightings of people seemingly uninfected by the virus. They hope a cure has been cultivated somehow and entrust Major Eden Sinclair (Mitra) to find it or be forced to flood the nation’s capital to stop another fatal outbreak. 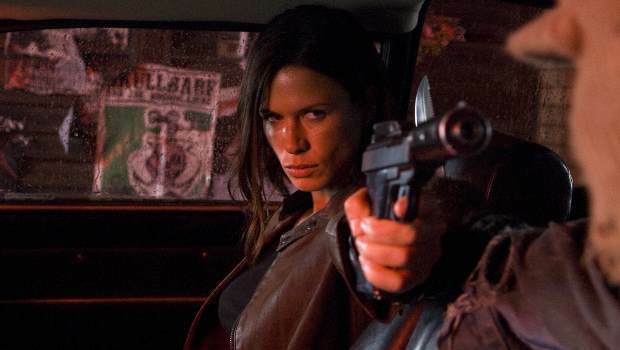 One-time Lara Croft model Rhona Mitra spends the whole of Doomsday in her former Tomb Raider character as a smart-talking, gun-toting action heroine. She seems to have also drawn inspiration from Kurt Russell’s Snake Plissken as she struts around which is thankful as once Marshall moves the troop into a desolate Scotland he also takes his cue from John Carpenter’s famous futuristic outlaw. Rather than be faced with hordes of zombies, the special forces team are besieged by a rouge Scottish army and imprisoned in the remains of Glasgow where one is cooked to the delight of a crowd baying for the intruders’ blood. The dark, brooding introduction makes way for fast-paced fights and an outlandish performance from Craig Conway as a cartoon-like tribal leader who is at odds with his father Kane (the ever-authoritative Malcolm McDowell) over whether to try to cross the southern border. Sinclair leads an escape to Kane via an unlikely-placed steam train before it all goes Mad Max with high-speed off-road vehicles loaded with weapons chasing Sinclair back to England. Marshall’s gore-laden effects make a welcome return in Doomsday as he stylises the violence as he did in Dog Soldiers to compliment his tongue-in-cheek storytelling as heads are sliced off and bodies burnt with glee. His brisk mixing up of genres ensures there is never a dull moment and he packs in enough explosions, gunfights and chases you might just forget to pay attention to the dubious logic behind Doomsday. How a steam train in a deserted land is a subtle mode of transport for a rescue mission and the usual trick of people turning up at the most opportune times are just two of the cliches resorted to in the hope we don’t notice a papering over of a few creaky plot points. But Doomsday is not the sort of film to be taken too seriously and captures the spirit of the films it borrows heavily from to best effect. It doesn’t stand up to much cross-examination, however Bob Hoskins is on hand to lend a few wise words as Sinclair’s government ally such as “You carry on the way you’re going, you’re going to wind up one seriously f**ked up individual”. It gives the impression Marshall wanted to have a play with his increased budget, and play he does — be ready for a frenetic ride through iconic apocalyptic settings.